"She's what I go to school for, even though it is a real bore". So popular boy band Busted once sang about their teacher Miss McKenzie. Luckily for Katie, the star of Imagine Teacher, there are no teenage boys to make eyes at her, just a class full of eager to learn pre-teens. Today, however, the inspectors from Lets-Play-DS.com are coming to her classroom, so she better shape up. 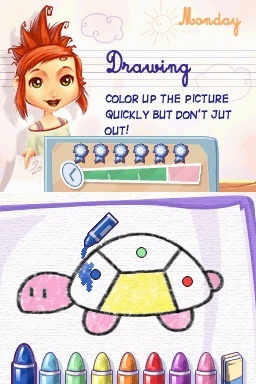 The drawing mini-game is nicely presented and is sure to appeal to the games target audience. The game opens with Miss Katie arriving at her new school. New being the perfect word to describe it, in fact the school is so new that Katie will start with a mere four students. As the player progresses however, new children will flock to her classroom provided she continues to do a good job. Fortunately for her, doing a good job isn't terribly difficult. Play is broken down into weeks and days, with two lessons per day. Each day starts off in your office at school. At the start of the week you can schedule lessons however you see fit by using your calendar. From your office you can also buy supplies and decorations for the classroom and keep tabs on your pupils progress. Once your done here, it's time to go to the classroom and start the lessons. Your first task of the day as teacher is always to seat the pupils around the classroom. Children who have fallen out must not be seated together. You have as long as you want to figure this out however and repeating this process every day can become tedious. Once you start the lesson proper, it's time for the obligatory mini-games. Each lesson has a different style of mini-game themed around it. "Reading" has you circling words on the screen containing a specific letter. "Writing" will have you picking out letters from words and writing them on the touch screen. The handwriting recognition is solid and only tripped up a couple of times. Biology lessons have you drawing lines between pictures of animals and their names. "Geometry" requires arranging triangles to recreate bigger shapes, "Music" requires you to memorise notes and play them back in sequence. "Pottery" simply requires you to rub the screen with the stylus until the pot is formed. "Geography" requires that you match flags to countries and "Drawing" includes a fun colouring in game. All the mini games are simple, but this is after all a game aimed at younger players. There's also some slightly more obscure mini games that simply have you tapping symbols on the touch screen. While this is happening, occasionally one of your pupils will start misbehaving, requiring you to tap them with the stylus to bring them back in line. At the end of some lessons, you'll be required to mark your pupils work. This section of the game is pretty funny the first few times you play it. It's not uncommon, for example, to see a child label a cow as a horse, then given the exact same animal on the next line, label it correctly.